Zora Neale Hurston—author of the classic Their Eyes Were Watching God—was a cultural anthropologist by training. 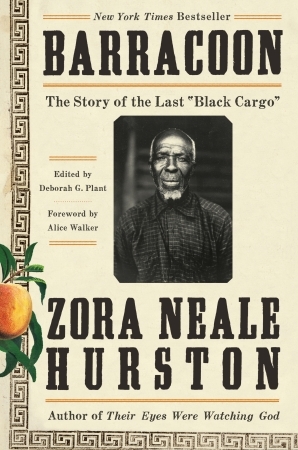 In 1927, the famous anthropologist Franz Boas sent her to Africatown, Alabama, to record the folk history of a man named Cudjo Lewis, a 67 year old freed slave, the last living African-born slave. The work was never published because publishers balked at Hurston's refusal to write without using dialect to reflect African speech. The story of Cudjo Lewis (originally Oluale Kossola) is both heartbreaking and fascinating. Kossola was born in Whydah, West Africa (modern day Benin or Nigeria), around 1841. His father, Oluale, worked for the chief in their town. In 1860, when Kossola was 19, he was sold into slavery by the King of Dahomey, who defeated Whydah. He was bought by William Foster, who captained the Clotilda, and was among the last group of Africans to make the middle-passage to America. At this time, it was illegal to import slaves. But Foster, along with the Meaher brothers, of Mobile, Alabama, saw the recent wars in Africa as an opportunity to purchase and smuggle cheap slaves into America. Barracoon is a story that needs to be told. In it, we learn of the fascinating life of Kossola in Africa, in a tribal society that is, according to Kossola's memory, incredibly civilized. Crimes are adjudicated by the tribal elders, the chiefs, and ultimately the king. Punishments are weighed in accordance with the crime, and a death sentence given only in the most severe circumstances. In contrast, the life of Cudjo the slave is incredibly brutal. Even after slavery, the life that Cudjo carves out for himself in America is one that is remarkably tragic and violent. After the Civil War, Cudjo and some other Africans work to buy land and build their own community in South Alabama, called Africatown. These Africans are misfits. They don't relate to the freed slaves who were born in America and their freedom does not give them the full rights and privileges of American citizenship that whites enjoy. As a result, they are looked upon as "savages" from Africa and ostracized as such. Cudjo, alone in this new America, takes a wife and has a family. Family becomes the community he needs to live in this foreign land. The story of Cudjo Lewis, however, is a tragic story about how his family is taken away from him one-by-one. All of his children die before him. One son is shot by an off-duty police office who has a disagreement with him. Another is run over by a train. Even his wife dies young, leaving him alone. He himself was hit by a train while driving a wagon back from town one day. The train did not signal as it began to move and the train company was found to be at fault in court; but Cudjo's white lawyer absconded north with Cudjo's settlement money. Left destitute and unable to work, Cudjo becomes the sexton at the church in Africatown. The church is his only community. These types of stories—a police officer who avoids responsibility for cold-blooded killing, a train company that tries to avoid responsibility for bodily harm, and a lawyer who swindles—are the type of stories that juxtapose the "civilized" life of America against the "savage" life of Africa, giving lie to the stereotypes. Cudjo keeps moving forward, finding a way in this new world. But the entire story is a lament about the global forces that ruined Cudjo's life and changed the shape of the modern world. Review: A great read for anyone who loves American Folk History and an essential read for anyone who wants to broaden their understanding of American History as a whole.